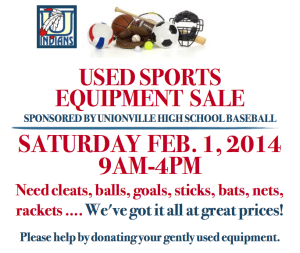 After weeks of orchestrating donations, the Unionville Baseball Diamond Club, the booster club for the Unionville High baseball team, has assembled an impressive collection of used sports equipment, and the public – as well as the team – will benefit. The sale, an exercise in creative recycling, will offer the used equipment to people who can use it at nominal prices, from 9 a.m. to 4 p.m. on Saturday, Feb. 1, in the Unionville High cafeteria. The public is invited to take advantage of the opportunity to purchase deeply discounted gear that includes hockey, baseball, and football equipment; some “unreal mountain bikes;” decent basketball rims; and golf clubs/putters, said Chris Jarmuz, the club’s president.